this winter at the Locale Magazine event in Newport Beach. The staff from Sidecar was sampling their doughnuts out of the back of a truck at the event and I remember loving a nutella doughnut they had, as well as the Huckleberry. As the doughnut flavors circulated at our table, we all commented on the freshness of the ingredients and the softness of the cake on the doughnuts. Delish!! After sampling the doughnuts a few months back, we were very excited for the grand opening of the Sidecar Doughnuts storefront in Costa Mesa, California. Costa Mesa is a fun little eclectic town with a variety of restaurants, boutique stores, and nightclubs and it is situated next to it’s neighbor city, Newport Beach known for the gorgeous blue waves housed in the Pacific Ocean. Doughnuts located on 17th street and Santa Ana Avenue in Costa Mesa and was quite pleased. 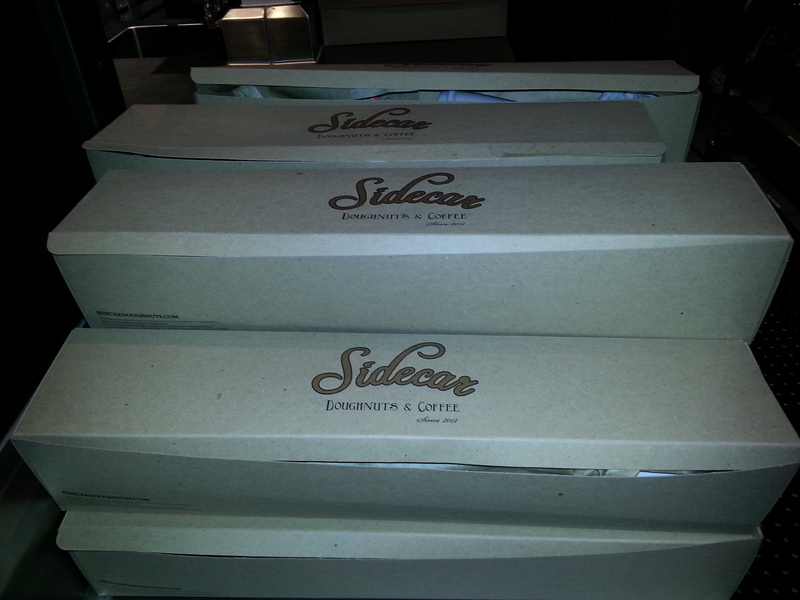 Sidecar has a perfect space in a busy shopping center to create delectable cakey morsels of many flavors. 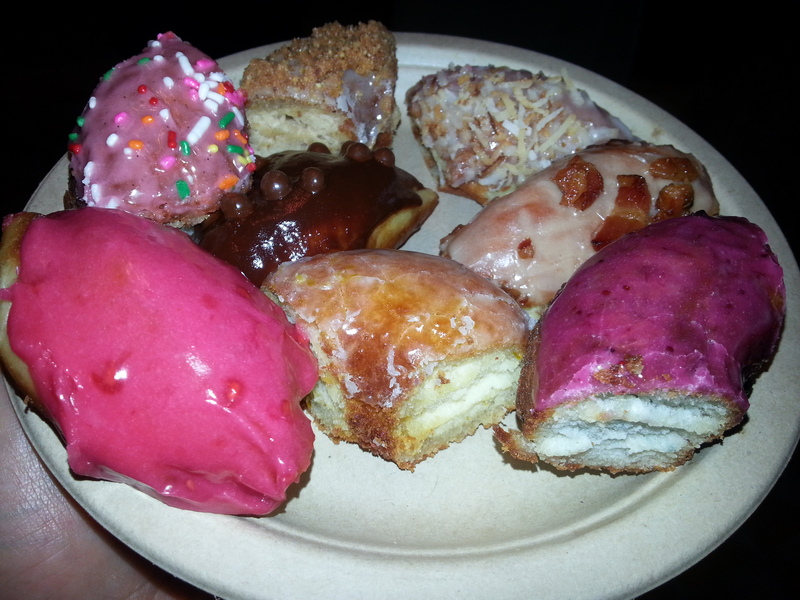 The doughnuts I sampled included huckleberry, Meyer lemon, cinnamon crumb, malasada, raspberry, and birthday cake. It was a perfect bite of each donut and each one pleased my taste buds greatly. 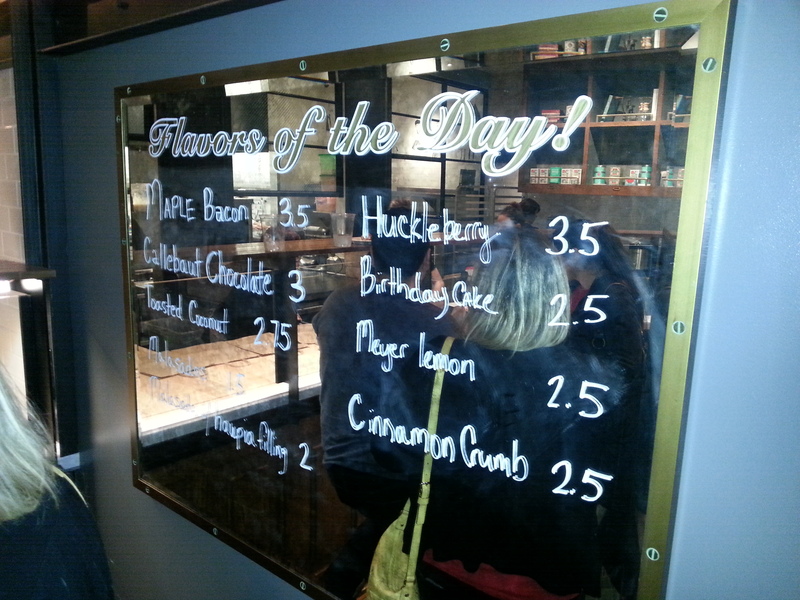 I definitely enjoyed all of the doughnuts, but my personal favorite was the huckleberry and the Meyer lemon came in as a close second. I liked the fact that these two flavors struck me as the most original out of the pack. There was one doughnut that was sold out by the time I arrived and that was the Malasada one filled with coconut crème. My husband ranted and raved about this one and I look forward to going back soon to try it for myself. Something awesome about Sidecar Doughnuts is that the variety of doughnuts is always changed regularly, so there is always something new to try. All doughnuts are made fresh daily each hour and once they sell out of fresh doughnuts, they only supply new ones the next day. 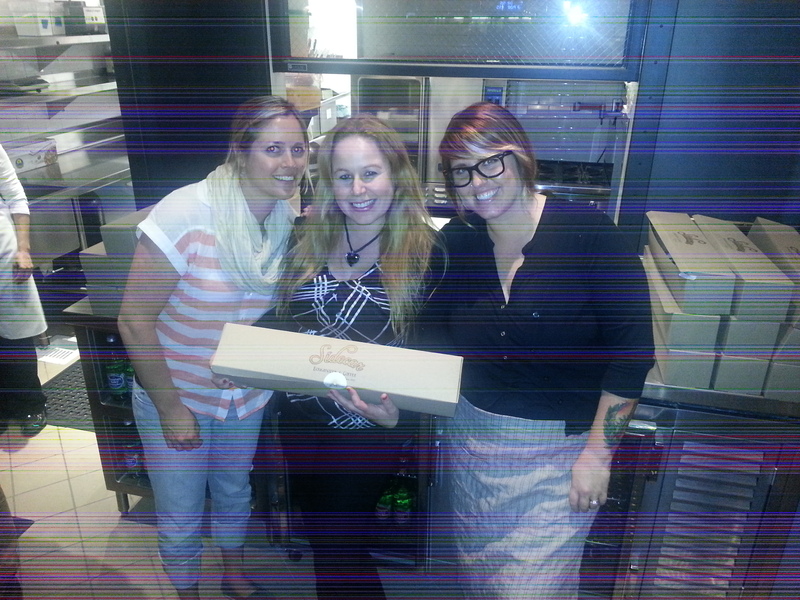 Owners, Brooke Des Prez and Sumter Pendergrast came together to create Sidecar Doughnuts. Pendergast is an artist and clothing designer originally from Atlanta that had a dream to open a coffee shop in Orange County sharing one of his favorite blends of coffee from Portland, Oregon, Stumptown coffee. Des Prez ran a catering business for the last 5 years in which she perfected the perfect doughnut. 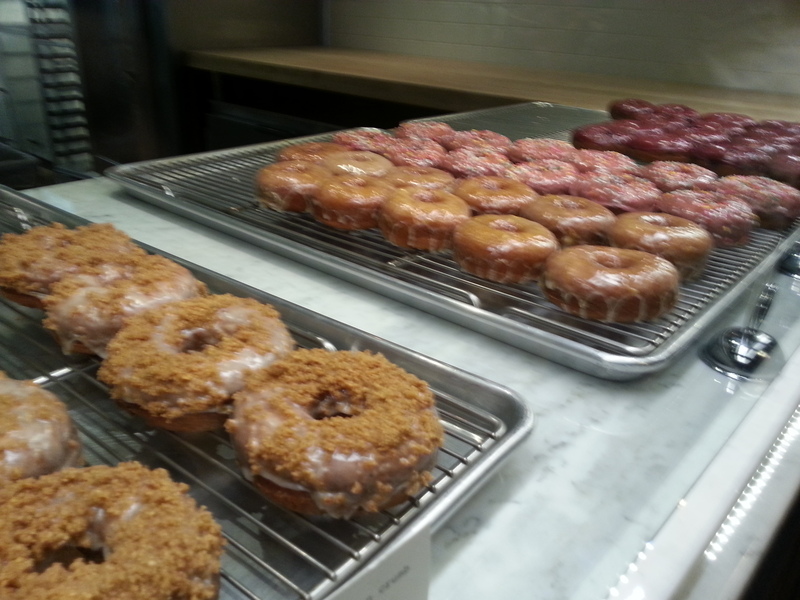 :) When Des Prez & Pendergast came together their vision came alive and Sidecar Doughnuts was born. I believe this place will be a great success..my only fear for them…keeping enough doughnuts on the shelves to feed the hungry customers..rumor had it there was an hour line wrapped around the building last week..Get em while they are fresh daily..only at Sidecar Doughnuts in Costa Mesa…I know where I will be grabbing a bite this week…mmmhhhmmm…yum!!! Sidecar Doughnuts by the dozen to go..
Those are really tasty doughnuts! 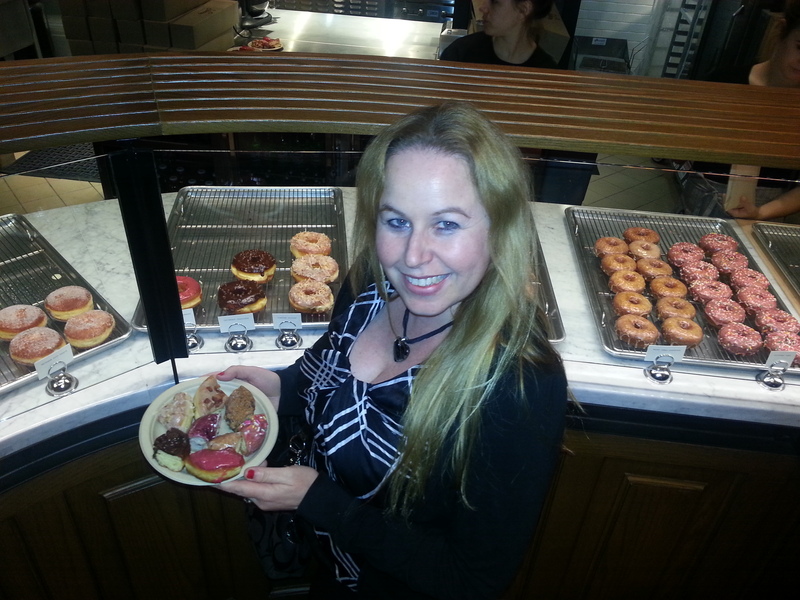 I could eat piles of donuts…love the sugar rush…so I limit myself to a few a year…and consider it a treat. The coconut cream sounds right up my alley!!!! Now i want a boston cream donut! These doughnuts look amazing and aren’t your ordinary flavors. I love cinnamon rolls myself but since I have been trying to lose weight I stay away from them. Don, that sounds awesome! I will have to check it out;) Thanks for sharing! 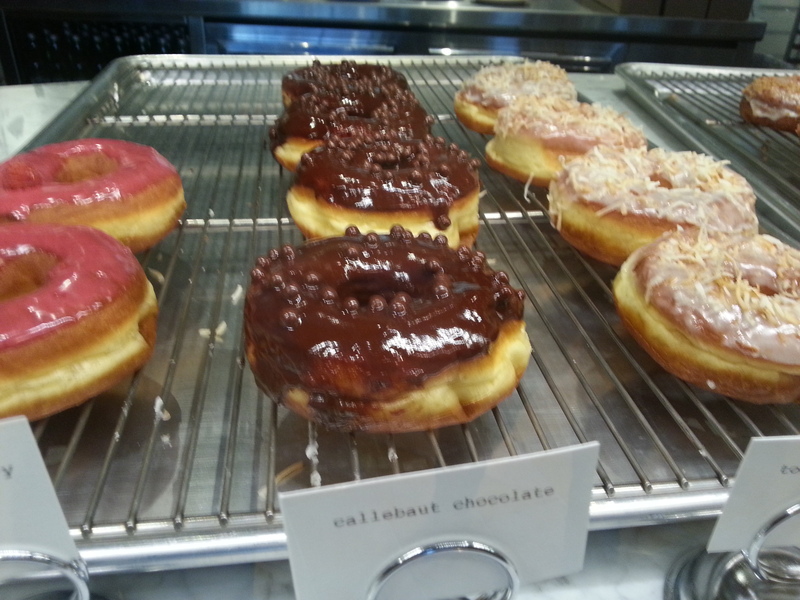 Yummmm…..I am a chocoholic, but fortunately for me I can pass on a donut. But gee, these look GREAT! It’s a good thing I’m in Arizona! Your blogs crack me up. LOL! Glad to crack u up and entice you with these delectable yummies! NOT doughnuts !! they look far too good !! My oh My…I must stay away. They look amazing!!! Man, you do find the neatest stuff!